Precious metals advanced Tuesday. Gains in platinum and palladium were their second in a row, and palladium scored another new record settlement — its second straight. Gold for April delivery added $5, or 0.4%, to close at $1,306.50 an ounce on the Comex division of the New York Mercantile Exchange. The settlement was the strongest since last Wednesday, March 13. "Although investment demand has been at times subdued, gold priced around $1,300 tells you there is still some institutional interest," Reuters quoted Philip Newman, a director at Metals Focus. 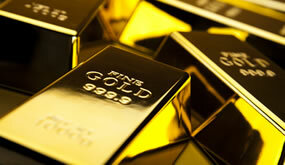 Gold futures ranged from a low of $1,302.10 to a high of $1,310.80. They slipped 0.1% on Monday. Silver for May delivery rose 5 cents, or 0.3%, to settle at $15.372 an ounce. The finish was also silver’s highest since last Wednesday. Silver futures traded between $15.32 and $15.45. They shed less than a half cent on Monday. April platinum surged $18.60, or 2.2%, to $852.60 an ounce, ranging from $834.60 to $856.30. Palladium for June delivery advanced $12.20, or 0.8%, to $1,551.90 an ounce, trading between $1,536 and $1,563.30. Gold added $2.10, or 0.2%, to $1,307.70 an ounce. Silver added 3 cents, or 0.2%, to $15.41 an ounce.